My father drove four hours round trip from Los Angeles today to visit me. We sat together at a formica table and feasted on vending machine cuisine such as BBQ chicken on sesame seed rolls, stale wheat thins, slices of cheesecake and diet sodas bought with the roll of quarters he had brought. The room was crowded and sometimes loud. My dad was great, sitting next to me for hours and entertaining me with interesting conversation. We spoke about the Dodgers and Manny Ramirez in particular. He expressed his enthusiasm about the new baby my older brother and his wife are expecting in early February 2009 and how excited he is to be a grandfather. I’m grateful that my little niece will only be a few months old when I leave Taft Camp and return to my family. My dad told me about home and made me forget that we were sitting inside the boundaries of a federal prison. Prior to my imprisonment, we rarely took the time for 4 hour chats. There was no excuse on my part for not making opportunities to share quality time with him as he frequently tried. I would tell him that my schedule was so busy with career obligations. Now I realize that I should have made family more of a priority. I’m grateful to have learned this lesson while I am still young and my parents are in good health and not aged. My father has always been around to support me and the love he has shown throughout my ordeal has strengthened me in ways that I can’t adequately describe. I am confident that someday I will find the words to express the love I feel for my parents. Right now my attempts to string sentences together seem inadequate. 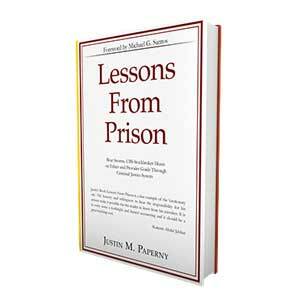 Prison gives one many opportunities for introspection. During the time I’ve spent at camp I have come to value my family more. During the hours of the aftermath of family visits, I lie on my rack and contemplate the blessings I’ve received. Prison may have taken a few months of my life, yet by helping me appreciate the value of my family, my mom, dad, brother and sister-in-law, something meaningful has come from my sentence. This discovery was not something I anticipated; yet I certainly appreciate it now. I was at the Fed Camp in Boron ( “camp fluffy”) in ’97. (later when it closed, most of the inmates were transferred to Taft) I never had a primer from my attorney either. I think you are providing a tremendous service. Also, I was shop steward for the carpentry dept. while there. Barbara Walters did a Special on the Camp and shortly afterwards, the olympic size swimming pool was filled in with sand! My room mate was Tammy Faye Baker’s husband. She drove over every visiting day from Sun City………….so many stories………….